Through the wisdom of these kind and compassionate Sangha members, our centre is able to offer teachings and dharma activities for the benefit of all beings. 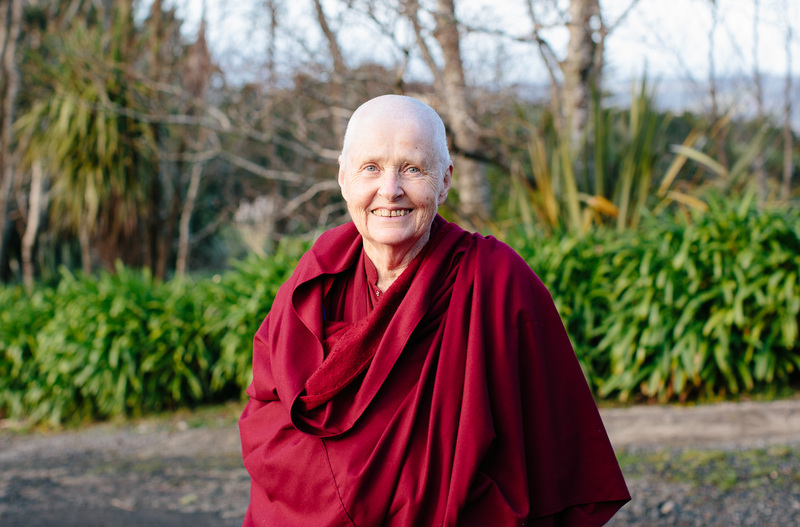 Fondly known as Geshe-la, is Jam Tse Dhargyey Ling’s resident spiritual teacher. Geshe-la is a highly skilled teacher who has attained the highest level of education in the Tibetan monastic system. Geshe-la was born in the Kham Province of eastern Tibet in 1941. When he was seven he was enrolled in the Dhargyey Monastery to begin his studies. In 1957 he went to the great Monastic University of Sera, near Lhasa, this was a 3-month walk at the time. In 1959 at the Norbu Lingka Palace of His Holiness the Dalai Lama, he took novice monks’ vows from the incomparably kind Kyabje Trijang Dorje Cjang and continued studying, but immediately had to leave because of the military action by the Communist Chinese. With many others, Geshe-la fled to India and Buxa where three monasteries had been set up. He studied Madhyaaka, Prajnyaparamita and Pamana there for ten years until 1969 when, in accordance with His Holiness’s wishes, he moved to South India to help build the new Sera Monastery. For three years, there was little opportunity to study until the new Sera was completed. In 1973 he began to study, until 1985 when he entered the Lharam class, the highest class in the monastery. He was awarded first-class in the 1989 examinations. He then sat through final Geshe debates before the whole monastery, gaining his Geshe degree in 1990. From 1991 onwards he taught logic, Buddhist philosophy and practice to the monks at Sera Je School. At the same time, in his house at the monastery, he looked after the needs of 80 students to ensure their shelter, adequate food, health and advise them on conduct. Upon returning back to Sera Monastery, Geshe-la received the invitation to come to New Zealand. It has been the Centre’s great privilege to have been under Geshe-la’s wisdom, compassion and guidance since October 1999. 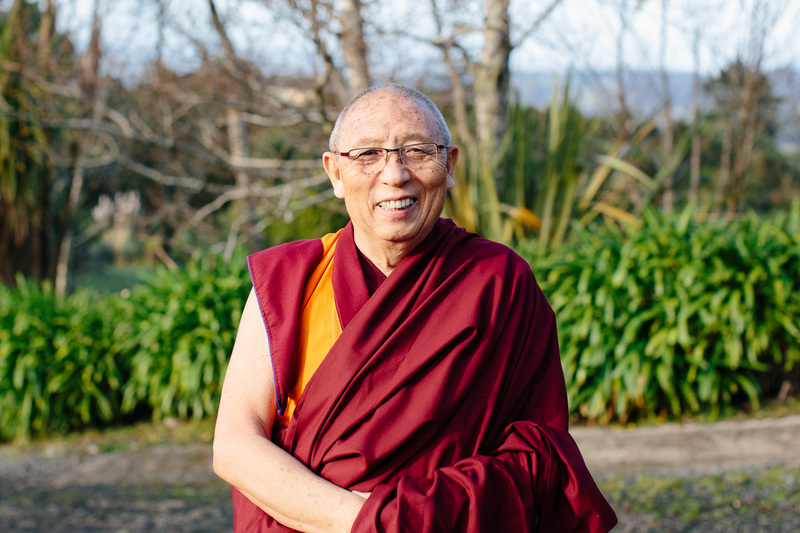 Geshe-la’s teachings, which are open to all, give wonderful insights, advice and practical methods on how to deal with issues of daily life with tools to overcome challenges and develop a kind, patient and compassionate mind and heart. Karma was born in 1971 in Kham, Tibet. He is the oldest of five children, which meant from a very young age he had many responsibilities in the home. Karma was destined to become his father’s successor. When Karma was 14yrs old and his father was away, his mother (who had a great desire for Karma to become a Monk) and Aunty took the opportunity to send him to India to study in the monastery. Karma and three other people tried to escape to Nepal by hiking through the Snow Mountains for many days. Unfortunately, they didn’t succeed. On their second attempt, they hid in the back of a big truck (paying the driver for their passage). This trip was successful. Arriving in Nepal they were helped by the Tibetan Refugee Organisation. After a short stay, Karma continued traveling to reach Sera Monastery in South India. Here he was received by His Holiness the Dalai Lama and chose to become ordained in 1989. Karma continued his study at Sera Monastery, gaining certificates in Advanced Buddhist Studies in 1998 after 7years study and in 2002 after 4years study. 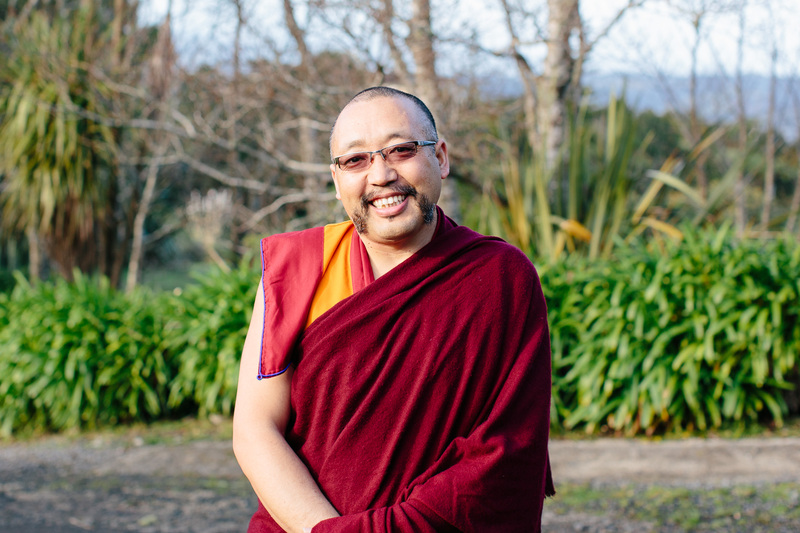 In June 2003 Karma came to New Zealand to become Geshe Sangey Thinley attendant. He now has New Zealand Citizenship. Karma has also learned the Tibetan Buddhist tradition of creating sand mandalas. He has been part of creating many sand mandalas locally, throughout New Zealand, Australia, South Africa and Taiwan. Karma can often be found working at our shop Himalayan Trading Post. Ven. Nyima Gyaltsen was born in Dhargyey, which is part of Kham in eastern Tibet. He lived at home with his parents until he was fourteen, he then entered the school belonging to Dhargyey Monastery, as a boarder. He studied logic and received teaching on the stages of the path to enlightenment. At eighteen received permission from his parents to travel to India in order to become a monk in Sera Monastery. With no travel permit, he risked imprisonment if he was caught. Together with twenty-five others, he made his way to Lhasa by truck. They then traveled on another truck until they reached a place called Lhatse, from where they had to cross the Himalayas on foot with the help of two guides they had hired. They reached Nepal safely and in November 1991 Nyima entered the Trehor Regional College, a part of Sera Je at Sera Monastery in South India. From 1991 until 1997 he followed the curriculum of monastic studies there. In 1997 he went to Dharamsala, the seat in exile of His Holiness the Dalai Lama, to take care of the Ven. Geshe Sonam Rinchen. In the same year, he began his studies to become a thangka painter. The course of studies that Nyima Gyaltsen followed lasted for six years. Since qualifying Nyima has completed more than thirty thangkas, including some very large ones. These are now in various collections around the world. In 2004 he accompanied Geshe Sonam Rinchen on a tour of Australia and New Zealand. During this time he taught several workshops on thangka painting and also demonstrated the art of thangka painting in the Auckland Museum. He made three further visits to New Zealand following that. 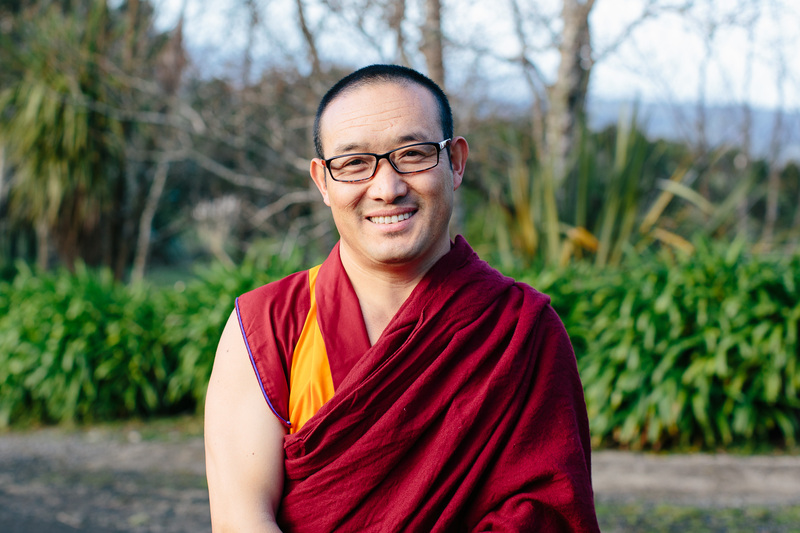 After the passing of Geshe Sonam Rinchen, Nyima requested to come to New Zealand and has been with us at the centre, teaching and painting Thangka since 2015.